The Egyptian Bureau for Cultural & Educational Affairs have the honour to invite you to Film Screening and Discussion Celebrating the creative life of documentary Film-maker Ateyyat El Abnoudy. The event screens three of her films, namely “Permissible Dreams” “Rawya” and “Cairo 1000-Cairo 2000”. The films are chosen to illustrate different periods of Ateyyat’s work and to shed light on the life of Egyptians in different geographical areas. 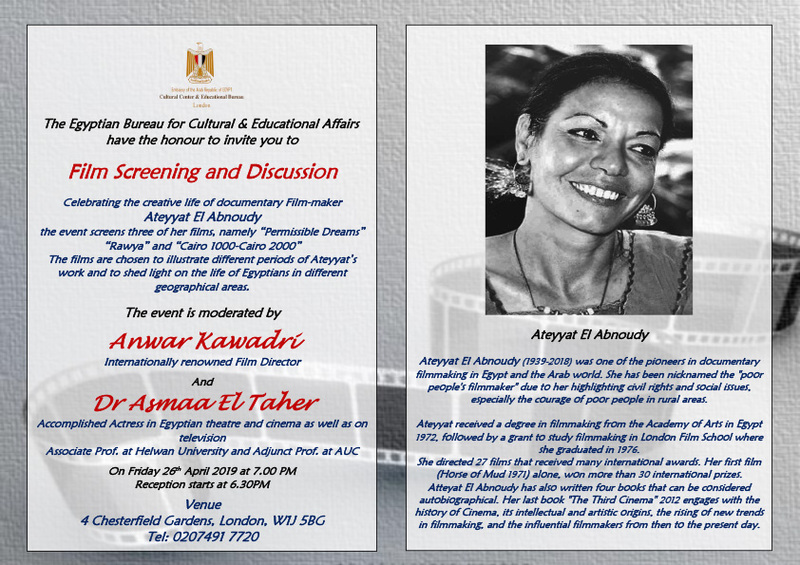 The event is moderated by Anwar Kawadri Internationally renowned Film Director and Dr Asmaa El Taher. Accomplished Actress in Egyptian theatre and cinema as well as on television. Associate Prof. at Helwan University and Adjunct Prof. at AUC. Ateyyat El Abnoudy (1939-2018) was one of the pioneers in documentary filmmaking in Egypt and the Arab world. She has been nicknamed the “poor people’s filmmaker” due to her highlighting civil rights and social issues, especially the courage of poor people in rural areas. 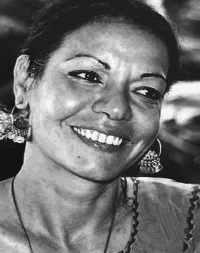 Ateyyat received a degree in filmmaking from the Academy of Arts in Egypt 1972, followed by a grant to study filmmaking in London Film School where she graduated in 1976. She directed 27 films that received many international awards. Her first film (Horse of Mud 1971) alone, won more than 30 international prizes. Atteyat El Abnoudy has also written four books that can be considered autobiographical. Her last book “The Third Cinema” 2012 engages with the history of Cinema, its intellectual and artistic origins, the rising of new trends in filmmaking, and the influential filmmakers from then to the present day.